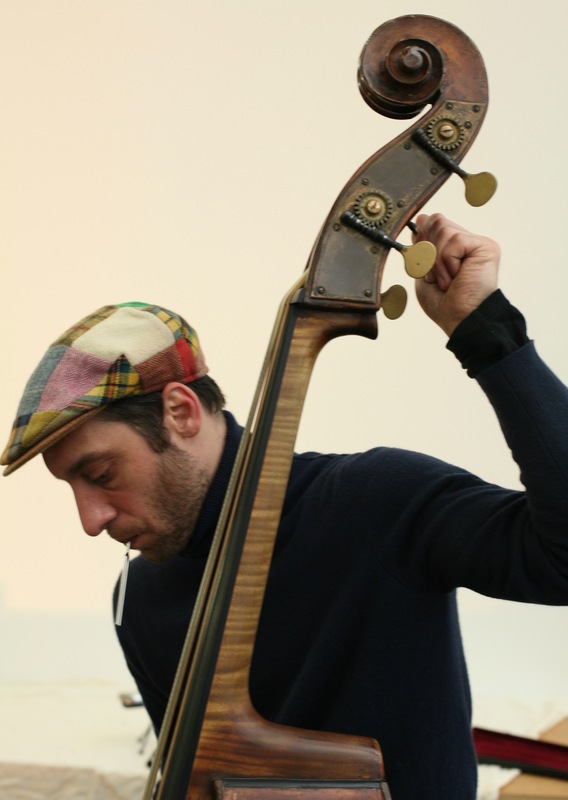 Double bass player Antonio Borghini is active since the late 90’s in the European music scene exploring the process of improvisation. His main focus is the collective, and how to develop together strategies that combine compositions, words and movements in an inclusive way. This way of working leads him to build long-term collaborations based on collective work, intuition and on the urge for invention. Double bass player and composer. In 2003 begins his long term collaboration with cellist Tristan Honsinger playing in the group “Small Talk”. In the years 2004-2006 he plays concerts around Europe with many projects such as “Domino quartet” with Sean Bergin, Gianluca Petrella and Hamid Drake; David Murray trio and quartet; the “Anthony Braxton quartet” and the Butch Morris Orchestra. His sextet “Memorial Barbecue” is invited to the international jazz festival in S.Anna Arresi. From 2007 till 2010 he’s the bass player in Mike Patton’s project “Mondo Cane”. In 2008 he publishes the first record of his music with the group “Malebranche”. The quartet “Eco d’alberi” is the first italian ensemble playing at the Vision festival in New York. In 2009 he moves to Berlin and quickly becomes part of the so-called “echtzeitmusik” scene. Out of countless musical meetings he co-founded “Hook, Line and Sinker”, a music theater ensemble with Tristan Honsinger, Axel Dörner and Tobias Delius; “Der Lange Schatten” with Michael Thieke and Håvard Wiik; “Die Hochstapler”, with Pierre Borel, Louis Laurain and Hannes Lingens; “Schnell”, a bebop-trance trio with Christian Lillinger and Pierre Borel. He is also regularly playing in Tristan Honsinger’s company “Hopscotch”; Alexander Von Schlippenbach quartet; “Quartetto trionfale” with Günter Sommer, Manfred Schoof and Gianluigi Trovesi; the double bass quartet “Sequoia” featuring Klaus Kürvers, Meinrad Kneer and Miles Perkin; “Umfundisi”, quartet dedicated to Sean Bergin’s music with Matthias Schubert,Tobias Delius and Christian Lillinger. Furthermore he plays in various combinations with many others such as Achim Kaufmann, Olaf Rupp, Henrik Walsdorff, Hilary Jeffery, Tony Buck, Rudi Mahall, Almut Kühne, Aki Takase, Sven-Åke Johanson and Chino Suichi.